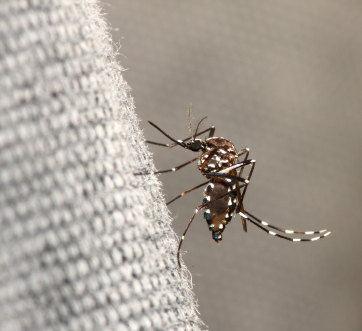 The Asian tiger mosquito or forest day mosquito, is characterized by its black and white striped legs, and small black and white striped body; similar to a tiger. The variation of the body size in adult mosquitoes depends on the density of the larval population and food supply within the breeding water. Because there is rarely and abundance of these two things, the average body size of an adult mosquito, is considerably less than 10 mm. These mosquitoes are native to the tropical and subtropical areas of Southeast Asia, however in the past couple of decades, this species has invaded many countries; through the transport of goods and international travel. The Asian tiger mosquito was first discovered in North America, at the port of Houston in 1985, in a shipment of used tires. Since then, they have spread across the southern United States, and up the East Coast; to Maine. This mosquito has become a significant insect control problem in many communities because it closely associates with humans (rather than living in wetlands), and typically flies and feeds in the daytime; in addition to feeding at dusk and dawn. 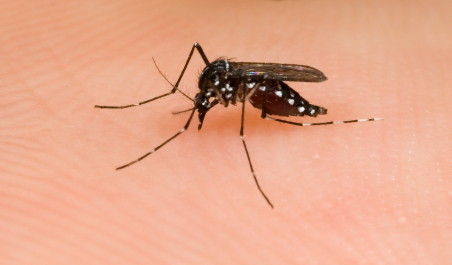 The Asian tiger mosquito often bites in forests during the day, and is also called the forest day mosquito for this very reason. Depending upon region and bio-type, there are differing active peaks, but for the most part they rest during the morning and night. I just got bitten by an Asian Tiger mosquito. First of all, it felt like somebody stuck a needle into me and my whole arm went into pain. Usually its no big deal to be bitten by mosquitoes, but this is really bad. Second of all, I have never seen a black and white mosquito in Northern San Diego.